Update – 2016: Nothing came of the new website. No interest, no responses to my queries to potential sponsors. Took the website down. I’m building a new website with the hope of attracting a sponsor and for sharing my enthusiasm for my latest hobby. In the last two months I’ve learned to ride a motorcycle and I absolutely love it. Well, love mixed in with moments of anxiety, uncertainty, and frustration. Hmm, that is love, isn’t it? I’ve secured the domain newmotorcylerider.com (site discontinued) and I will be building the site there. My initial thought is to pen ten essays on different topics. Things like taking the Motorcycle Safety Foundation course, buying one’s first motorcycle, clothing and accessories, dealing with the weather, and so on. All subjects squarely focused on the beginning rider. In addition, I’d have some original photography as well as a video or two. My ideal sponsor would be Cycle Gear (external link), a nationwide accessory retailer. But I will have to work very hard to impress them. The initial articles would all be samples. Only five hundred words or so, just to show a sponsor I can write. Instead of posting one article at a time, like with a blog, I think I will post all ten articles at once, inside a conventional website. One possible article is below, something on my first ride two months ago. I was so worried about my upcoming Motorcycle Safety Foundation course (external link) that I found a guy on Craigslist who gave motorcycle coaching by the hour. I’ll call him Pirate Rick. I wanted some practice with a motorcycle clutch before the group lesson. Although I had years of using manual transmissions in cars and trucks I had never been on a motorcycle before. I knew the experience would be very different and it was. Using a manual transmission in a car means doing three things at once. So it is, too, with a motorcycle. Let’s consider starting. Simultaneously, you shift into gear while depressing a clutch while pressing the accelerator. Let’s break that down. In a car you engage the clutch with your left foot pedal. With a motorcycle, by comparison, you work the clutch with a hand lever. With a car’s manual transmission you shift with your hand. With a motorcycle you shift with your foot. To get a car moving you press the accelerator pedal with your right foot. 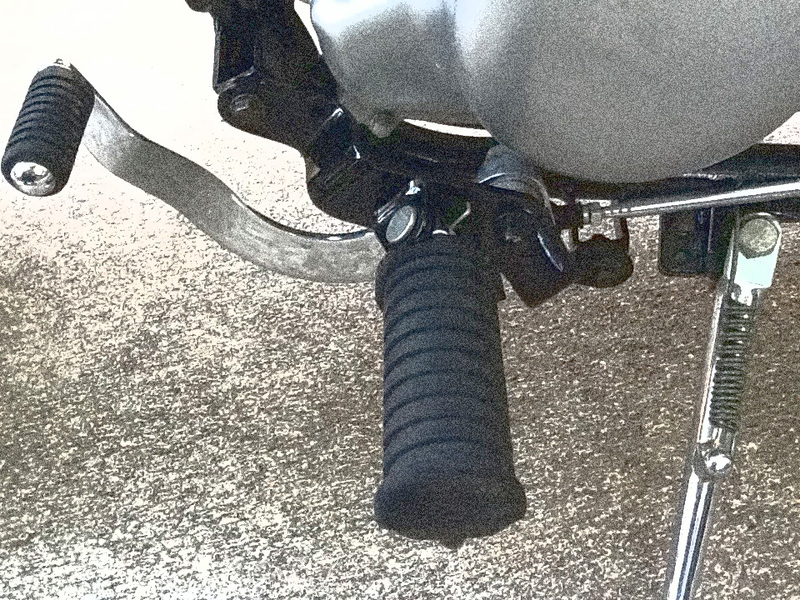 With a motorcycle you twist a rotating handgrip on the handlebar. Got it? Somewhat? Same results in all three cases, but done in three different ways. Shifting shouldn’t be overwhelming. If you get flustered remember it’s because there are many things going on all at once. It’s not your fault if you learn slowly; it’s a process to repeat over and over. Motorcycling is a skill. It takes practice to become proficient. And that challenge is partly why the sport is so engaging. But back to Pirate Rick. On a sweltering Tuesday in May in north Sacramento, I met Pirate Rick at his suburban home. A few cars whizzed by now and then on the city street, too many for my nervous condition. Rick introduced me to his Honda Rebel, which he used for instruction as well as for renting out to people for their DMV exam. I was ready to ride, or so I thought: I had helmet, gloves, boots, and jeans. “Do you have a learner’s permit?” Rick asked. Oops. Didn’t think about that. I was not legal to ride on a public road. I had assumed we would go to a private parking lot or somewhere else that was low-key and anonymous. Actually, I hadn’t even thought about where we’d ride. I was just hoping it was somewhere with some shade. Rick surveyed his street. He said, “I think will be okay here.” And so I began my first ride . . .
Motorcycle shift pedal on the left. Foot rest in the center. My next blog post may not be for another week or two. I’ll be busy writing articles and putting the framework of the website together. This entry was posted in Uncategorized and tagged cycle gear, cycle gear.com, Motorcycle Safety Foundation course, MSF, new motor cycle rider, new web site, newmotorcyclerider.com. Bookmark the permalink.